Trying to look discreet, I kept glancing at the man across the street. What was his story? What journey had led him here? What were the warm parts of his life? Who did he have in his life – his story? It felt like the coffee was taking forever, or was it just because now it truly mattered? I kept glancing up the street looking for Steve and the coffee; meanwhile this corner in San Francisco with Union Square across the street, had taken on a whole new feel. 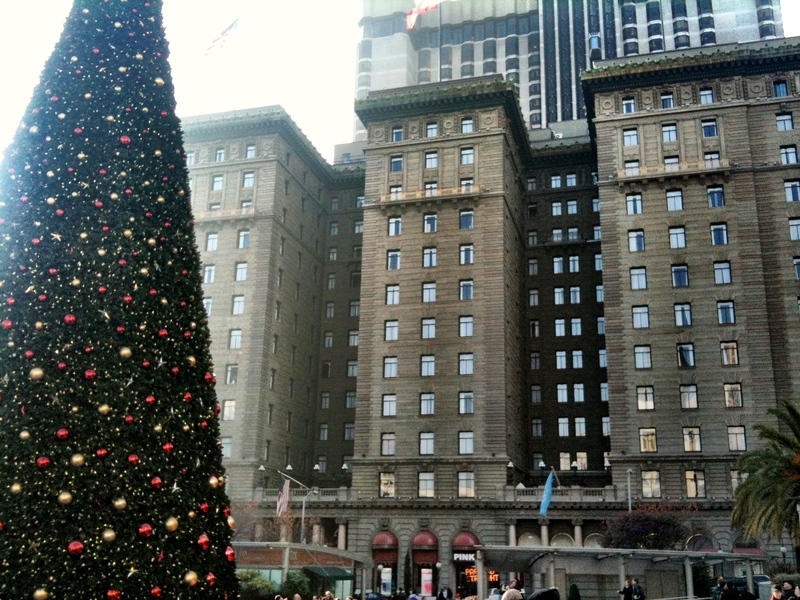 Gone was the charm, gone the Christmasy, romantic atmosphere so many times associated with a city during the holidays. It was as if all this stuff, all these buildings even, were hindrances to the souls hiding in the shadows. Finally, after what seemed like hours, I spotted Steve making his way towards me. Coffee and sandwich in hand, we waited for the signal to cross the street. The man stood there still, leaning against the cold stone building, watching the people pass by, looking towards all the signs that screamed “BELIEVE.” Finally the light changed and as we crossed the street and got closer and closer, I saw that it wasn’t the same man who had been in Starbucks. He was almost wearing the same clothes, but as we drew nearer I could see his face was different and he was taller. It had been too good to be true… We approached him anyway and Steve asked: “were you recently in Starbucks looking to buy a coffee?” The man looked bewildered and surprised that someone was even talking with him, and finally shook his head, replying “no man, I wasn’t there.” His sheepish smile and clear eyes lifted some of the heavy load from my heart. He then said, “But I could really use something to eat and drink right now,” and so we gave him the sacred coffee and sandwich, wished him a Merry Christmas and told him to spread the love. The trolley car ding-dinged as we made our way back to Union Square, and the bustle of the city continued as if nothing were different. I felt disappointed yet warm all at the same time. That first man in Starbucks was still out there somewhere, but he had inspired what had just taken place, and another human being had gotten a coffee and sandwich in his honor. That look, forever singed into my soul, had given me new eyes, yet had left me wanting – yearning to reach out beyond myself. It almost would have been too easy to have found the same man, too simple of a fix. If I had found the same man, it may have only been to appease my own feelings of guilt. This reality was much more poetic somehow – my eyes were more tuned-in to the surroundings, the people, the needs. And it was all in his honor. Unbeknownst to him, he had started a tiny revolution in my heart. 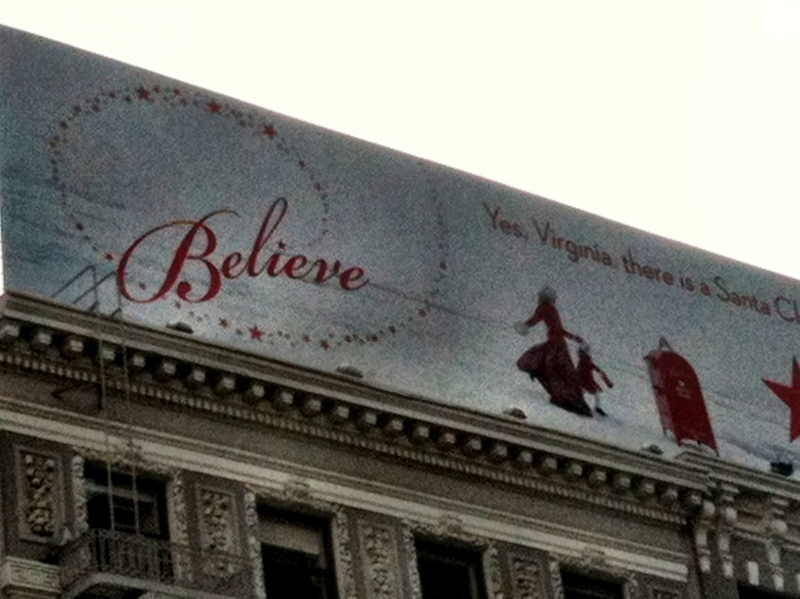 I looked up and saw that word again: Believe. Believe. According to the first definition from dictionary.com, to BELIEVE means “to have confidence in the truth, the existence, or the reliability of something, although without absolute proof that one is right in doing so: Only if one believes in something can one act purposefully.” Believe is a verb, and so as a verb it is an action, state or occurence. As a verb forms the main part of a sentence, so this verb, “BELIEVE,” had suddenly formed the main part of my day. Believe has to have action associated with it. It’s not mere words. To believe means that you become the very thing you believe, and to become means that action is taken. This occurence in the Starbucks coffee shop challenged me to be more than a facebook post, more than a few hours spent on a Christmas morning in the tenderloin, more than a few words typed on a computer screen, or texted to a friend. To believe is not just a conviction. It’s not merely a confession made with words from my mouth. To believe, by definition, requires the words, convictions, resolutions and texts to actually take on flesh and blood and become legitimized by real actions…which will result in real change. 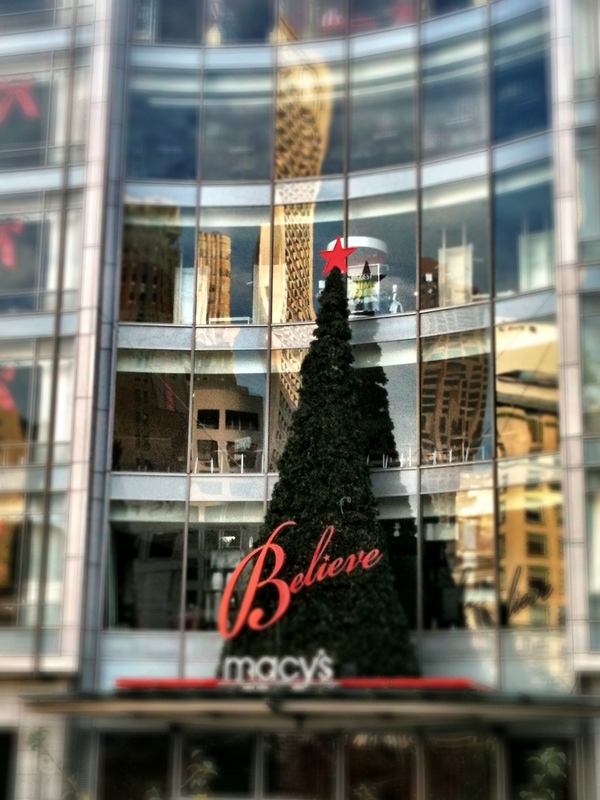 And so, under the rise of the Macy’s building, with its “BELIEVE” ringing out like bells on this Christmas Day, everything continued to take on a new look for me. I noticed more lonely souls, not just the homeless, but the average and the well-to-do, all sitting around the giant tree, alone on this Christmas day. I saw children patiently kneeling down, hands outstretched, trying to gain the pigeon’s trust to eat crumbs from their palm…and then laughing delightedly when the pigeons would scurry away – their eyes so full of hope and joy. I saw the sun sinking behind the towering sky-scrapers of the city as another beautiful day was coming to an end – a day of oppurtunity to recieve love and give love and exist beyond self for this time in earth’s history. And I saw a man leaning against a stone-cold building, eating a sandwich and drinking a hot coffee – and it was Christmas. Believe.